Trendy. It's a word that we hate and love with equal fervor, especially when it comes to weddings. We want our celebrations to be unique and express our individuality, yet, we are bursting to emulate the latest fab thing we swooned over on Pinterest. How do you stay current, and still express your style and personality? 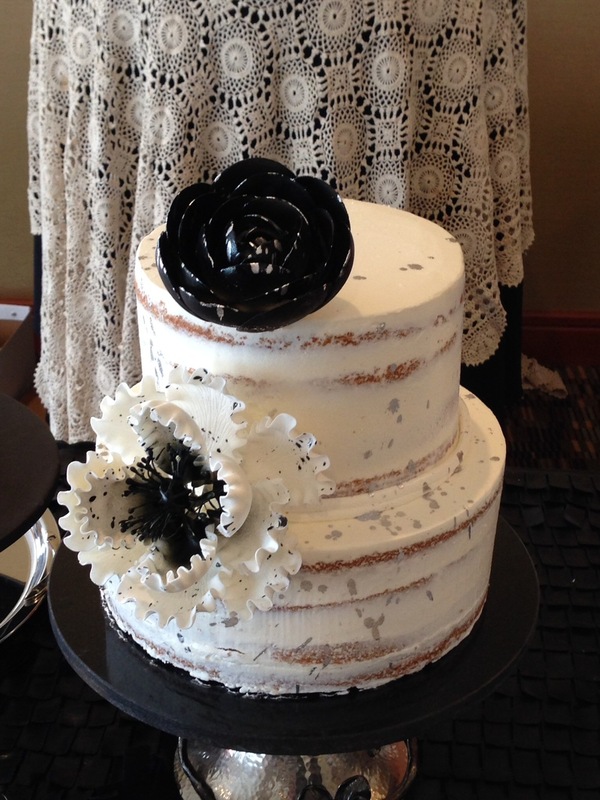 One of the latest trends in wedding cakes is the "naked cake". What is it, and why has it disrobed? A naked cake in form, resembles a traditional wedding cake. It is a tiered confection, and is often adorned with fresh or edible flowers, and fruit, and a minimum of buttercream and fuss. No fondant, no frills, no piping or draping. Just yummy cake and dreamy buttercream. Usually naked cakes evoke notions of rustic retreats and barnyard banquets, however it is possible to have a naked cake that is sweet, simple and sophisticated, gorgeous and glam, or rock star ready. There are a couple of things to consider before you strip your wedding cake bare. - This is a cake that needs to be made and decorated very close to the day and time of your wedding. Since it's missing the protection of a thick layer of buttercream on the outside, it is more prone to drying out. - Choose a cake that is moist. Any cake that has fruit in it holds up well. Great flavors for a naked cake would be carrot, banana, apple or even chocolate. - Fresh fruit fillings or custards are not as stable as buttercream. They may leak or settle, spoiling the appearance of your cake, so choose your fillings wisely. A flavored buttercream is your best best. Also, remember that different flavors will impact the color of the buttercream, so opt for flavors that reflect the color scheme of your big day. When in doubt, use a vanilla, almond or lemon buttercream, as those will be neutral in color. - Any flowers or fruits that are used on your cake should be pesticide-free, and non-toxic, so that you and your guests are not getting a dose of chemicals with their slice. Not all flowers are safe for consumption. Consult with your baker and florists about your options. - Keep in mind the overall decor of your event, and choose similar accents for your cake so that it all makes sense together. Here are a few of the naked cakes that we've done this year. Each reflects the personality of the couple, and the ambiance of their wedding celebration. i received a phone call last week from a dad attempting to get a custom cake for his twin daughters' sweet sixteen. nothing unusual there. i get inquiries often. this one was a little different because this would be the second set of birthday cakes for his girls. dad explained that the first set was a cake wreck of epic proportions, and he needed to make it up to them. apparently there was a collapsed tier, a very late delivery, and a final product that didn't remotely resemble what was discussed. that cake disaster led me to think about the things i do to prevent misshaps in my kitchen, and what you as clients can do to ensure that you get exactly what your hearts (and tummies) desire. so let's say you're in the market for a house. you go online and look at awesome pictures of beautiful floor plans, and decide which builder you're going to use. that builder then tells you, "no worries, i've built hundreds of houses. never had one collapse yet! and i don't even use blueprints. i've got it all up here (pointing under his hardhat)!" you wouldn't use that builder. you wouldn't trust that he could create what you asked for, and make it safe and secure. it's the same with your custom cake. your baker needs a guide or plan, no matter how many years they've made tasty treats. when i first started making cakes, i would use a picture of another cake as a reference. when i began designing custom cakes, i quickly learned that i needed a sketch in order to ensure that what was in my head came out in buttercream just the way i and my client had envisioned it. in the beginning the sketches were rough and crude, but now, i've honed my drawing skills the same way i've become more adept in sculpting in fondant. those renderings are more than just a pretty picture. they're a way of communicating between you and me to make sure that we have a shared vision, and that your cake house doesn't come tumbling down! quick tips for choosing a baker - get a solid referral from someone you know and trust. - ask to see pictures of their most recent work (keep in mind the quality of the pictures can give you insight into the quality of the work. i will not show a client grainy, out of focus, or photobombed images) - even if there is no contract (small cakes, not wedding cakes), make sure you have a description of the cake in writing, or a sketch of what the final product should look like as well as your delivery/pick-up time. I like cake. I suppose I should, since I bake it. All. The. Time. I like pie and brownies even better... but I digress. I kind of like icing, but I could live without it. I could eat cake all day with no icing, just plain; warm out the oven....mmm... I'm going to my happy place in my mind :) Funny enough though, most of you out there want cake and icing together. That's fine I get it. Makes my job easier. It would be harder to decorate a cake without icing. Yup. Infinitely harder. What's hard for you is that you've got choices to make - buttercream or fondant to make your cake dreams reality, but it seems that not everyone knows exactly what each of those are and what they can do, no matter how many reality cake shows are out there. Welcome to Icing 101! What is buttercream? Buttercream is a whipped icing that is made with hot sugar syrup, egg whites or whole eggs, and butter. That's it. This is not to be confused with that "buttercreme" stuff they sell in those refrigerated cases, that are made of shortening and confectioners' sugar. If you've never had the real stuff you have been missing out! It's got a silky texture and can be flavored with everything from vanilla to lemon, and can be used both as a filling, especially when blended with fruits or liqueurs, and as decoration. It can be piped into flowers, textures, and designs. It tends to be the most popular icing choice for wedding and special occasion cakes. What is fondant? Fondant is a pliable sugar dough. It is made of confectioners' sugar and a sugar syrup. It too can be flavored. It is used only for decoration and not filling. Fondant can be sculpted into flowers, bows, or ribbons, and forms to what shape cake you place it around. Fondant is gaining in popularity because it gives a very clean or realistic finish depending on the cake. Buttercream vs. Fondant - Buttercream is very sensitive to temperature. It doesn't like warm environments, so buttercream is not a good idea for an outdoor summer wedding reception. - Fondant holds up better to changes in temperature and because it goes on top of a layer of buttercream, helps to keep your cake moist. - People love the way buttercream tastes. It's super yummy. Because fondant is a dough, it's chewy, and folks aren't used to chewing their icing, so a lot of people don't like it. - People love the way fondant looks. When executed well, it is immaculate, with a porcelain finish. You get very true colors with fondant, and it works exceptionally well for 3D and sculpted cakes. You can get the best of both worlds with a combination of both buttercream and fondant. No matter what you choose, be sure your cake lady (or man), is skilled at executing in that medium. Buttercream can be made ultra smooth, or fondant could be lumpy and bumpy depending on how experienced your baker is! Here are some of my most favorite buttercream and fondant decorated cakes! what's the big faking deal? every year event and wedding design reveals new trends. most of those have to do with color, shape, texture, or graphic images. one trend that's been around for the past few seasons is frugality. now being a girl who has champagne taste and a coca-cola pocketbook, i understand that not everyone has oodles of disposable income to throw at their wedding or celebration. it's important in these difficult financial times that we make every cent count twice. so i applaud thrifty-ness and bargain-hunting. brides are all about diy, from their invitations to their bouquets, to favors, forget fake it till you make it, just make it! all of those handmade items bring a certain whimsy and personality to a wedding, and i'm all for it! since brides are being discriminating with their dollars, event planners are being creative with cost-cutting, thus, the fake cake. most cake designers have created fake cakes before; tiers of styrofoam covered in fondant or plaster and decorated to look like a fab wedding confection. they've been made for bridal shows and exhibits, or for displays in their shops or studios. i've made quite a few myself. some of the work pictured on my website consists of display cakes that i've decorated for various occasions. up until recently most of us have never been commissioned to make one for a real live event. brides and planners are soliciting display cakes for show & pics, and then sheet cake for the kitchen with the hopes of saving some scratch. here's the thing... that actually won't save you money. in some cases it may actually cost you more! allow me to debunk a couple of myths for you. wedding cake costs more than other cake; bakers automatically charge more when they hear the word wedding. - not true, unless you are comparing the cost of a wedding cake to your local bakery or grocery's grab & go birthday cake. personally, i charge the same for any special event cake - birthday, wedding, anniversary, baby shower, etc.. the price is determined by the level of detail and the amount of work that will go into a specialty design. no one will know the difference, i can just get cake from costco (nothing against costco, i LOVE costco - where do you think i get all that butter from?!) to keep the number of servings down. - ummm... nope. most cake decorators have an all-or-nothing clause in their contracts. you must get all cake from them. this is designed to protect them and their reputation. guests don't know that the groom's cake came from one place and the wedding cake came from another. they just know they had cake. and if one is really awful...only one gets all the credit/blame. they won't differentiate. also, sheet cake looks different. it's usually two layers of cake and one of icing/filling, whereas wedding cake is usually three layers of cake and two of filling or icing. you wouldn't want your guests to think there's been a bait and switch! so how can you save on your wedding cake? when is fake cake appropriate? be realistic about your budget and share that information with your cake designer. s/he will present you with ideas that are within your price range if you are up front about it. simpler is usually less expensive. choose a design that will not require hours of detail work. nix the sugar flowers and go with silk or fresh, non-toxic blooms. choose a smaller cake for display (big surface+fancy details=more details & more time. little surface+fancy details= less details & less time) and other types of desserts like pie or cookies will reduce the amount of servings you'll need. choose a smaller display cake and kitchen cake provided by the same baker. supplement the size of your cake by the addition of one or two fake tiers. this may not save you on decorating, but it will save you on the number of serving. i hope this helps you navigate the world of cake!